Beautiful San Diego Yacht Club played host to the 2016 United States Match Race Championship for the Prince of Wales Trophy. 10 teams competed, eight by qualifier and two by invitation, from all corners of the country. The regatta was sailed in J 22’s over three days of sailing. The format was simple, a round robin followed by quarters, semis and finals. The round robin was tight but Nevin Snow’s team went undefeated, a perfect 9-0 to take the top spot. Dave Dellenbaugh, three-time winner of the Prince of Wales Trophy, was second with a record of 8-1, with four-time team race world champion, Colin Merrick rounded out the top three. In the quarter finals Snow and his team picked, Steve Natvig to race in a best of five series. Dellenbaugh chose Women’s Match Race National Champion Nicolle Breault. Colin Merrick chose Long Beach Native Dustin Durant, which left Dartmouth College sailor Charlie Lalumiere to sail Huston native Glenn Darden. After intense racing: Snow, Dellenbaugh, Merrick and Lalumiere advanced to the semi-final. In the semi’s Snow put their perfect record to work against Colin Merrick and his team from Newport, Rhode Island. In race one, Snow copped a penalty during the prestart, which lead to the team losing their first race of the regatta. With their backs against the wall, Snow rattled off two straight wins to advance to the finals. In the other semi-final, Dave Dellenbaugh made quick work of Charlie Lalumiere to advance to his fifth consecutive finals. In the finals, Snow and his team made quick work of Dave Dellenbaugh and his team winning the series 3-0, to give Snow his first US Match Race National Championship. 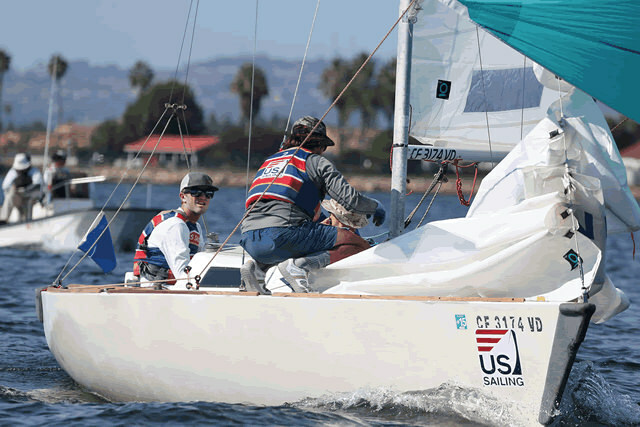 Snow was sailing with Ullman Sails Newport Beach’s Alex Curtiss, Nick Kaschack (Santa Barbra, CA) and 12 year-old Peter Bush.